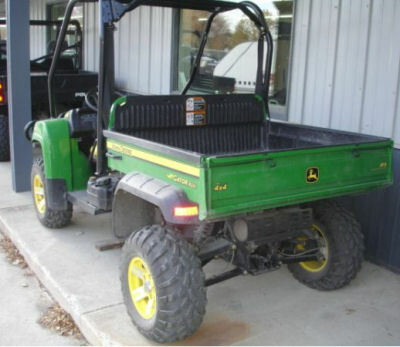 The 2008 John Deere Gator XUV for Sale is a good running 2008 John Deere Gator XUV 620i that currently has only 93 hours on it. The Gator has a front brushguard and a power dump box. If you would like more information or additional pictures you can e-mail me using the comments form found directly below this classified (and don't forget to mention that you found this ad on Strike Lightning's Used ATVs for Sale gogocycles.com). Strike Lightning's GoGoCycles Used Motorcycles for Sale would like to invite our visitors who are having problems with their John Deere Gator to leave a description of the problem that you are having to see if somebody who stops by might offer a solution or give you some advice on how to fix your ATV (and DON'T FORGET to leave your contact information in case they need to get in touch with you). The ATV is located in FARIBAULT, MN 55021 and my asking price is a very cheap $7995 so email me today and don't forget to mention that you found this ad on Strike Lightning's Motorcycle Classifieds www.gogocycles.com!